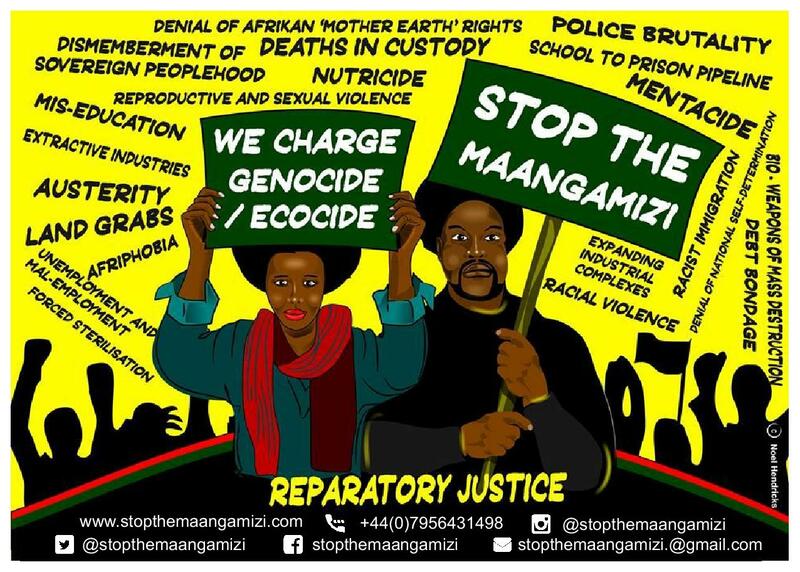 Now that you have signed the ‘Stop the Maangamizi!’ Petition, do you want to take action to get redress for the Maangamizi (Afrikan ‘Hellacaust’ of chattel, colonial and neo-colonial forms of enslavement) as it affects you, your family and community? Here is an example of how you can do so; please see the ‘Stop the Maangamizi!’ Postcard template below, which we urge you to send to your MP. You can find out details about your MP here. 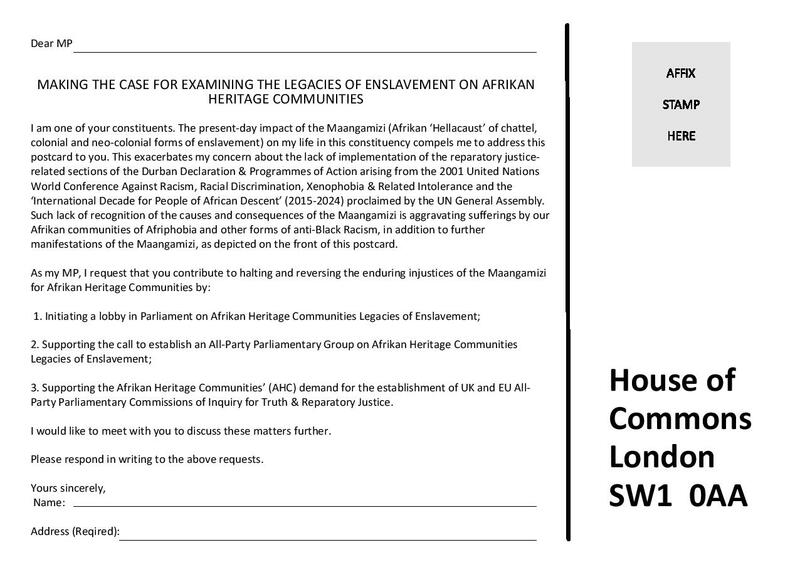 We also attach a template letter which has been revised to include reference to the issue of ‘compensation to enslavers tax fraud’ which is the subject of a separate but connected ‘Refund Our Taxes To Compensate Enslavers!’ petition. You can print off and sign the following letter here: SMWeCGEC Template Letter to MP- Elected Official. The letter is also drafted in such a way that you can send to any publicly elected official, not just MPs. The postcard and letter are tools aimed at enabling you to better lobby and engage with establishment decision-makers about including Maangamizi impact issues as they affect you, your family and community in the constituency representational work and local, national and international policy-making they prioritise. Please keep us updated in the SMWeCGEC about any progress you make as we are beginning to map which MPs are responding positively to the campaign aims, our contacts can be found here. This is very important because the experience we have so far is that MPs want to know who else is being lobbied and taking action on the campaign demands contained in the postcard and/or letter. It is essential for us to have this data and info about which individuals and groups are making what approaches to which publicly elected officials and in which geographical areas across the UK. Check out this guidance on lobbying MPs and other elected officials. You can also read this ‘Stop the Maangamizi!’ Postcard advocacy case-study. See here for other ways that you can take action. We look forward to hearing from you about any progress you make or any barriers you may encounter! We are developing a page to identify Maangamizi desecrators and deniers so are interested to know if you encounter any public officials that can be characterised as such.